The York County Beekeepers Association is made up of local community members - many are your neighbors. Save The Bees! Donate Today! Did you know that bees are responsible for pollinating a major portion of the world's food supply? The York County Beekeepers Association is committed to raising awareness and promoting resposnbile beekeeping in our area. If you woud like to help us accomplish this mission please consider making a donation. Do you have a swarm of bees in your home or on your property? Local beekeepers may be able to help you remove them. 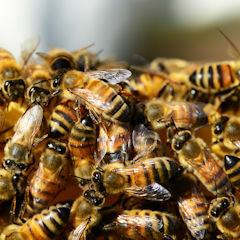 Learn more about bee swarms and who you can contact for help or guidance. Look for locally harvested honey or beeswax? We've provided a list of local sellers. Bees are fascinating creatures.Use our resources t learn amore about how bees swarm, produce honey and survive during the winter months.